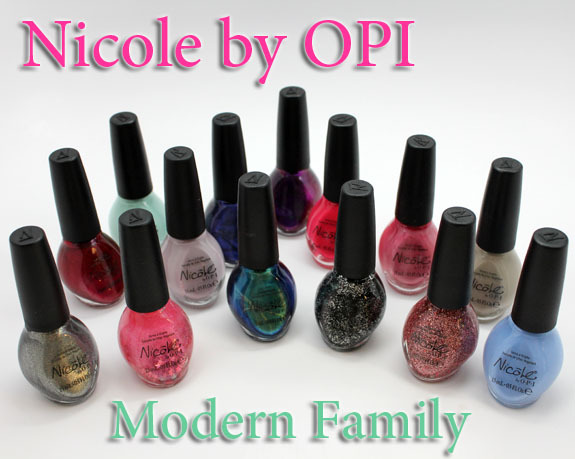 Nicole by OPI and Twentieth Century Fox recently collaborated to make the Modern Family collection, based on the hit ABC TV show. A show I’ve been watching since it started in fact! This collection features fourteen new shades that run the gamut from cremes to glitters, from beige to blurple. All of them are named after characters on the show as well. For most of these I had to use three coats to get the desired saturation. A couple were two coaters though. Quite a few had some streaking issues, mentioned below. Am I Making Myself Claire? is a soft lilac creme. The formula with this was a bit patchy and streaky. It evened out decently though after three coats. Alex By The Books is a seafoam green creme. Not quite a mint, kind of pastel looking. It was definitely streaky and thick, and even after three thin coats wasn’t completely perfect (see pinkie nail). Pretty shade though. My Jay Or The Highway! is a cool-toned beige/taupe creme. Ah much better formula with this one than with the previous two. The texture was really nice, not too thick or sticky and it covered great in three thin coats. Stand By Your Manny is a pale periwinkle with multi-colored shimmer. Boy oh boy did I want to love this one but the formula made it impossible. This is four coats and you can still see patchy areas. It just would not cover evenly for me! Lovely shade, bad formula. She’s Lily Something has a light pink sheer base and pink iridescent glitter with large star glitter chunks. The stars are large and sink to the bottom of the bottle. You have to dig them out and place them where you want. It’s a little too sweet for me personally, but very girly! A Like-Haley Story…is a bright fuchsia pink with subtle pink shimmer. This shade is so pretty and fun but I did have some issues with the formula. It was a bit streaky and need three coats I think. I only used two here and you can see some areas where it didn’t cover perfectly. A Phil’s Paradise is a silver/grey metallic. This one had pretty nice coverage with just two coats. Good formula. Back In My Gloria Days...is a deep purple with lighter purple shimmer. Super sparkly and rich looking. It applied a bit watery and sheer though, so three coats are necessary, especially on the nail tips. 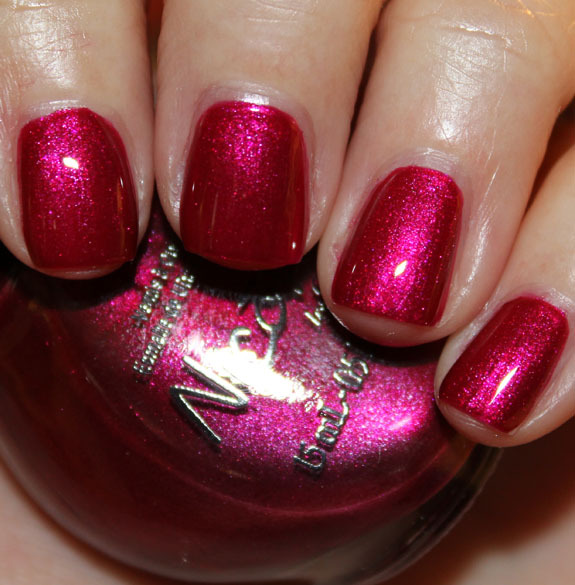 Basking In Gloria is a jewel-toned pink/red shimmer. It’s very rich and glow-y. Gorgeous shade and nice coverage in two coats. 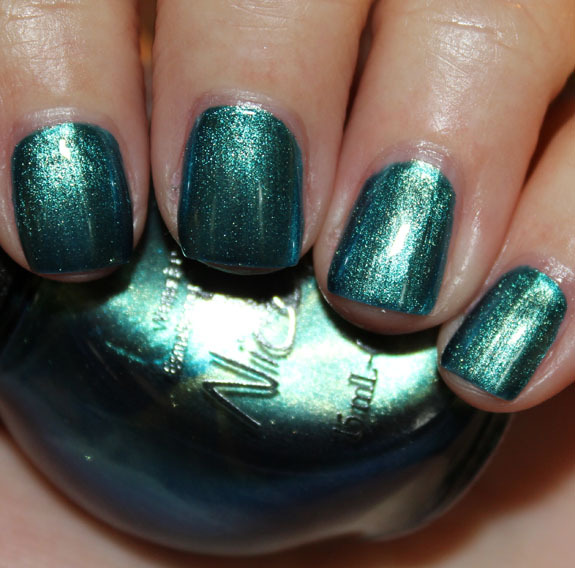 Candid Cameron is a deep metallic teal. Nice formula, covered great with two coats. Haley Good Lookin’…has a sheer pink base and lots of pink micro-glitter with larger hex glitter pieces. Would look best layered. This was two coats. I Do De-Claire! is a rose pink frost. Sorry but blech. This immediately screams 1984 to me. The formula is very streaky because of the frostiness, so you can see brush strokes really easily. It does cover well in two coats though. Not a “modern” finish at all! What’s The Mitch-uation? is a blue/purple metallic. It’s dark, but very obviously a blurple. Decent formula maybe a wee bit streaky. This was two coats. Luke Of The Draw has a black base and lots of multi-shaped silver glitter. The base is a little bit watery and sheer but I only used two coats here. You get a whole ‘lotta glitter with each coat, which is nice. Availability: Target, Walmart, CVS, Rite Aid, Kmart, Ulta, etc. What do you think about the Modern Family collection? Anything here you need? Note: Nicole by OPI is cruelty free. Milani 3D Holographic Nail Lacquer Giveaway! These are way better on your fingers than just in the bottle. Thanks for the swatches – I LOVE the first two. I’ll have to pick them up! I’m finding some weirdness with these polishes. The non-glitter Haley, Manny, Jay, Alex, and Lily are NOWHERE to be found near me. I’ve checked Ulta, Target, every single drugstore. The Claire ones are only at my Target. It’s like half the collection didn’t get released around me! Very disappointing. Great swatches! though having issues with the formulas your swatches always look great. The only shade here calling my name is Candid Cameron! So bad that Stand By Your Manny has a bad formula. I like the colour. Thanks for the great swatches, but unfortunately none of the colors are jumping out to me. They all seem like I’ve seen them somewhere before. Ugh! I really REALLY wanted Stand By Your Manny to be a good formula! It would replace my love for an equally lovely, equally streaky and hard to work with Revlon Blue Lagoon, albeit a bit different colour. Any other suggestions as a good replacement for Blue Lagoon? Can I tell you how much I love the little pictures you do at the ends of nail polish posts? I can pretty much convince myself to buy any polish based on the bottle color or on macros, but if I see it “in context” on your fingers, I know how it’ll really look (especially since my skin tone is pretty close to yours). Thank you! Not purchasing a single one. Yikes! I just got Back In My Gloria Days, and discovered that Sally Hansen Diamond Strength in All Aglow is a very good dupe for it. I like Stand by Your Manny but that’s about it from these. I’m powerless to resist the siren song of a dusty pale lilac! It’s the only one of the bunch catching my eye, though. Thank you for these lovely swatches! Colors dont do anything for me. 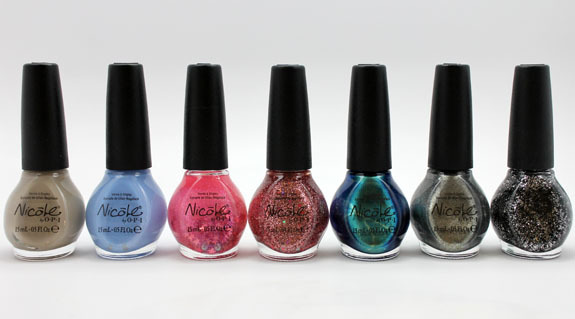 So far no nail polish collection has moved at, 2012 was just a huge nail polish bore/flop for most collections. Half of them are copy and repeats..just total bore. I hope something great will come out for 2013 soon.